Sometimes you need more support and stability than a cane with a standard tip as a base and Quad Canes are a great solution. Sometimes you need more support and stability than a cane with a standard tip as a base and Quad Canes are a great solution. All Quad Canes can rotate for use with either right or left hand. 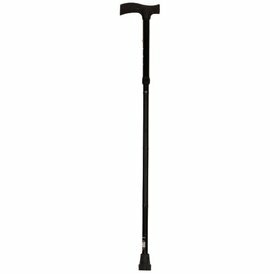 Choose from small base or large base quad canes. The large base quad canes are most sturdy while the small base quad cane is smaller and more mobile. • Height-Adjustable and Reversible for left or right-hand use. • Normally adjustable height between 28" - 37"
• If refurbished stock is indicated as available, please call 1-866-201-3829 for product details and specifics.